US construction spending increased for a third straight month in February, boosted by gains in both private and public construction projects. Construction spending during February 2019, released Monday by the US Census Bureau, was estimated at a seasonally adjusted annual rate of US$1,320 billion, +1% above the revised January estimate of US$1,307 billion and a nine-month high after an upwardly revised +2.5% surge in January. Construction spending increased +1.1% on a year-on-year basis in February. Be ahead of these data releases! Don’t delay, this week’s softwood lumber market comment was published to the website Monday morning. Spending on private construction was at a seasonally adjusted annual rate of US$995 billion, +0.2% above the revised January estimate of US$993 billion. In February, the estimated seasonally adjusted annual rate of public construction spending was US$326 billion, +3.6% above the revised January estimate of US$314 billion. 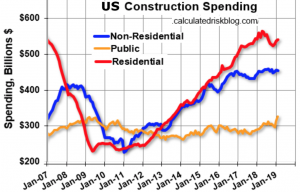 On a year-over-year basis, private residential construction spending is down -3%. Non-residential spending is up slightly year-over-year. Public spending is up +1% year-over-year.